After arriving in New York city in September 1965, Srila Prabhupada struggled alone for a year to establish the Krishna Consciousness movement. He lived simply, lectured whenever and wherever he got an opportunity, and gradually began to attract small interest in his teachings. On February 2, 1966, he bought a reel-to-reel tape recorder for $54.02. On February 19 and 20, he recorded his Introduction to Gitopanishad. In July of 1966 Srila Prabhupada founded a spiritual society intended for worldwide participation. He called it the International Society for Krishna Consciousness (abbreviation: ISKCON). At the time of incorporation, Srila Prabhupada had not attracted even one committed follower. 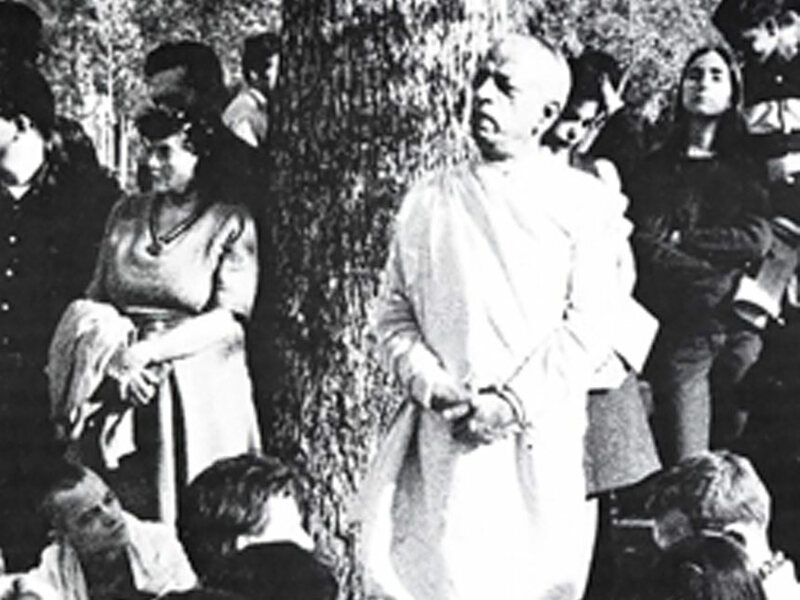 In New York’s Tompkins Square Park, under a big tree, Srila Prabhupada chanted the Hare Krishna mantra and slowly many people joined him in his kirtana. This tree is still preserved as a monument and is considered to be of spiritual significance. In a storefront in the Second Avenue (New York) Srila Prabhupada conducted classes on the Bhagavad-gita. One of the early visitors of Srila Prabhupada in the storefront was Allen Ginsberg, the famous poet. Allen had been captivated by the Hare Krishna mantra several years before, when he had first encountered it at the Kumbha-mela festival in Allahabad, India, and he had been chanting it often ever since. When he heard about Srila Prabhupada, he came to the storefront to meet him. On September 8, 1966 Srila Prabhupada conducted the first initiation ceremony in the storefront. By 1967, Srila Prabhupada was ready to expand his mission beyond New York to San Francisco, Los Angeles, Boston, Buffalo and then on to other countries. He sent his disciples to London where contact was made with George Harrison from the pop group – The Beatles. George Harrison became very interested and he released a record of chanting which reached the number one position in the UK popular music charts. This exposed millions of people to the maha mantra, and greatly pleased Srila Prabhupada who flew into London and personally met George. Later George donated a large manor house in the English countryside to the movement. Srila Prabhupada established various Vedic schools, called gurukulas, where children were trained in Krishna Consciousness from a very early age. He set up cow protection programs on several of his larger projects to care for cows and bulls even after their productive lives were over. He set up an academy of artists who painted fabulous devotional artworks for his books. He also established the Bhaktivedanta Institute made up of disciples, expert in science and mathematics, whose mission was to disprove various atheistic theories and disseminate Vedic knowledge. He wrote scores of books and initiated thousands of disciples. He travelled from continent to continent, country to country, city to city, town to town, preaching the message of Krishna. He arranged for massive food distribution programs. Millions of free plates of vegetarian foodstuffs spiritualized by offering to Krishna have been distributed to needy people around the globe. Thus Srila Prabhupada fulfilled the prophecy of Lord Chaitanya. All over the world the words Hare Krishna Hare Rama have been heard on the streets, at festivals, on the radio and on television. The holy names have gone to every town and village. It was Srila Prabhupada’s faith and devotion that brought about this colossal transformation.